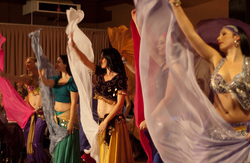 The Advanced class is suitable for students with at least two years belly dance experience. It caters to students who want to extend their knowledge and practice of the dance as well as those who just want to have some fun and improve their fitness. Be prepared to challenge yourself in a creative and relaxed environment. Performance opportunities are available to interested students.